Pascal Viville received a PhD in Chemistry from the University of Mons (Belgium) in 1997. 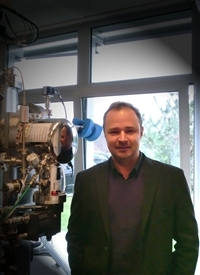 After a two-years postdoctoral position at the University of Louvain-la-Neuve (Faculty of Applied Science), he joined the group of Jean-Luc Brédas at the University of Mons in 1999 as a postdoctoral Research Fellow. In 2005, he became the research coordinator of the unit of Chemistry at Novel Materials, at the Materia Nova Research Center in Mons. The CMN laboratory at Materia Nova develops its skills in the formulation, implementation and physical characterization of new materials and structures for future Smart Device applications. His current activities concern the management of collaborative projects with industrial and academic partners, mainly for the development of new concepts and new strategies for the fabrication of organic electronic devices (OLED’s, organic and hybrid solar cells, DSSC,…).